With the festive holiday, Dia de los Muertos, coming up, what better time to travel to this cultural hub in Mexico? Built on the ruins of the Aztec capital, Tenochtitlan, Mexico City offers a host of cultural, historical and modern tourist sites, scattered across the vast city. With so many affordable things to do, delicacies to try and sights to see, Mexico City is truly a memorable experience for the enthusiastic traveller. Located in the Valley of Mexico, in the centre of the country, the city invites tourists to immerse themselves in the local culture. Dia de los Muertos, the Day of the Dead, is a celebration of the lives of those who have passed. Coco, the marvelous Pixar animation with Dia de los Muertos at its core, gives a pretty good idea of the festivities you can expect. Steeped in traditions, tourists can experience two days of celebrations (November 1 and 2). Usually late at night, the main square, Zocalo, is a sight to behold with clusters of traditional shrines featuring candles and signature marigolds. Also packed with mariachi bands and people dressed up in scary costumes with skull-painted faces, the vibrancy of the festival is one of its kind, as the locals commemorate their dead. Since 2016, visitors have also been given a chance to join the locals who gather on the sidewalks in anticipation of the annual parade, complete with colourful floats, dancers in beautiful costumes and a lively atmosphere, overall. Once you’ve enjoyed the two days, give the city a wander. Visit Museo Frida Kahlo, house of the renowned Mexican artist, and the National Museum of History, situated inside the Chapultepec Castle that sits atop a hill, thereby having spectacular views. 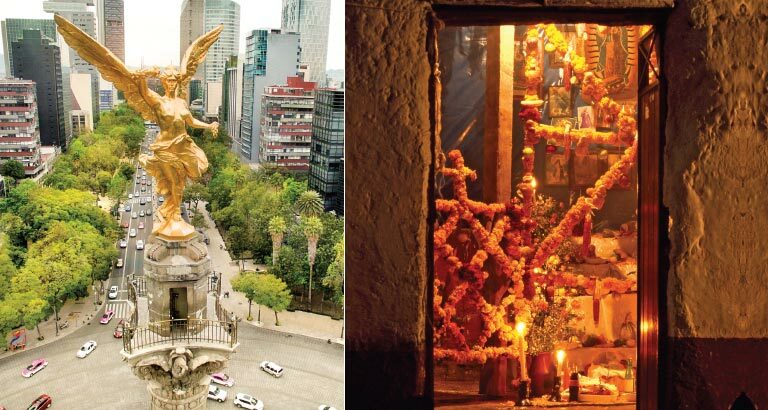 Marvel at The Angel of Independence, a victory monument of Mexico’s War of Independence. Stroll through the Coyoacán and La Lagunilla markets for some inexpensive shopping, while you savour a warm torta, a crusty Mexican sandwich with loads of filling, from one of the many food trucks or stalls you’re bound to see lining the streets. Having visited the top tourist spots, end your trip with some fun – head to the largest amusement park in Latin America, Six Flags México, located on the southern edge of the city. It’s home to hundreds of thrill rides, roller coasters and other adrenalin-pumping adventures.